In addition to producing Ziontific’s Silent Disco for the weekend — Jeff Bujak will also be performing 2 sets of ‘Silent Buj’ alongside the lovely acrobatic hoop-master Jen Dulong. 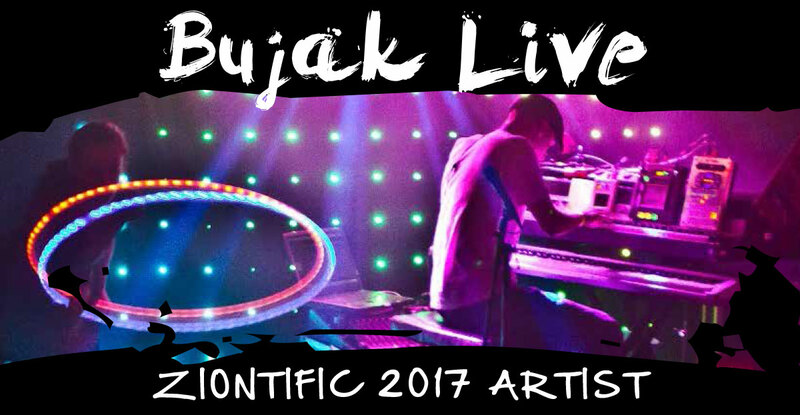 Massachusetts based performance duo ‘Bujak Live’ is Jeff Bujak (on the keys) and Jen Dulong (on the LED hula-hoop). Jeff Bujak is a solo experimental/progressive music producer from Massachusetts who creates instrumental songs centered around classical composition, progressive rock and dance music that dives deep in the waters of complex live electronica. Jen Dulong performs on stage alongside Jeff with an LED hula-hoop and other shapes providing beautiful lighting and movement with a visual depth to the solo musician. Bujak is carving a new path in the live-music scene one show at a time.